ARLINGTON — With all the offensive firepower Highland Park possesses, the contributions of the defense at times tend to be overlooked. But in the crucial fourth-quarter moments leading up to the Scots’ third consecutive Class 5A Division I state crown, it was the defense that made the momentum-changing plays. 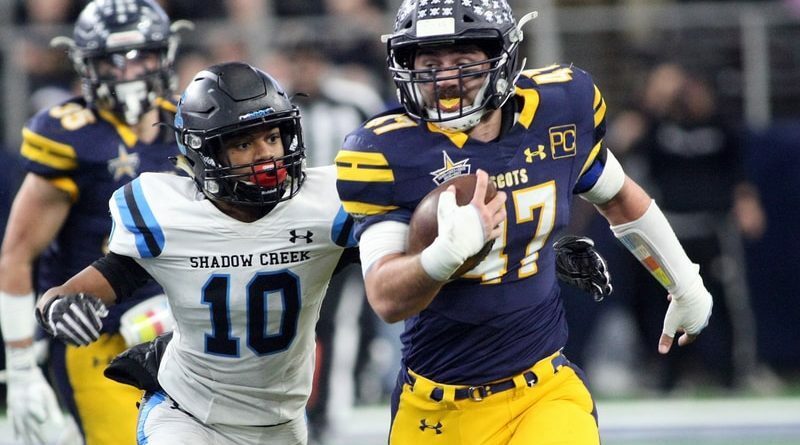 Despite scoring only three points in the second half, Highland Park rode a defense that contributed four interceptions and nine sacks to a 27-17 victory over Alvin Shadow Creek on Saturday at AT&T Stadium. Shadow Creek pulled within 10 points on a 99-yard scramble by Jamarian George early in the fourth quarter. A punt return to the HP 28 had the Sharks threatening again. Defensive end Prince Dorbah chose that moment for his biggest contribution, chasing down George for a shoestring sack that resulted in a loss of 17 yards on fourth down. Dorbah, the game’s defensive MVP, finished with six solo tackles and four sacks that resulted in a negative 39 yards. In all, HP set a new UIL championship game record with nine sacks, breaking a mark that Manvel set against the Scots a year ago. “We came into the game knowing how important it was to keep them from getting the edge,’’ said the 6-foot-4, 210-pound junior. Senior defensive back Whit Winfield exhausted Shadow Creek’s last hope with a title-sealing interception in the final minutes, his second of the day. In the opening quarter, textbook coverage on a deep post positioned Winfield for his first interception. Shadow Creek had to travel only 12 yards for its first touchdown following a Scots turnover. Later in the half, the HP defense forced a field goal after Shadow Creek had a first-and-goal at the 2. Three consecutive plays failed totaled five yards in losses. 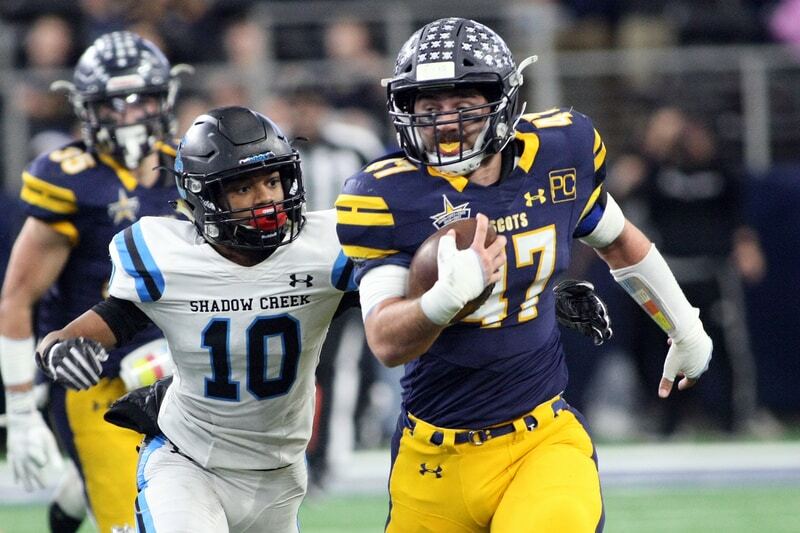 Colby Hopkins’ second-period interception led to an HP field goal and Hudson Clark stymied a Shadow Creek possession early in the fourth quarter. Cale Melton, in his first season as defensive coordinator, has seen the Scots takeaway total soar. The four turnovers raised Highland Park’s season total to 44, with 18 of those coming in playoff games. Brock Bakich led HP in tackles with nine. Patrick Turner and Grant Gallas each contributed a pair of sacks. “Once they got us in a hole, they could turn those big guys loose,” said Shadow Creek coach Brad Butler, once the quarterback of an Allen-coached team at Brownwood. A post-game press conference with the opposing coach fawning over the Highland Park defense. Now that is a change.